Actually, this was the first dress I made for myself. When I made it about a year ago, I didn't like it. I can't remember why! I pulled it out of my closet this fall after sundress season was over, and I loved it! 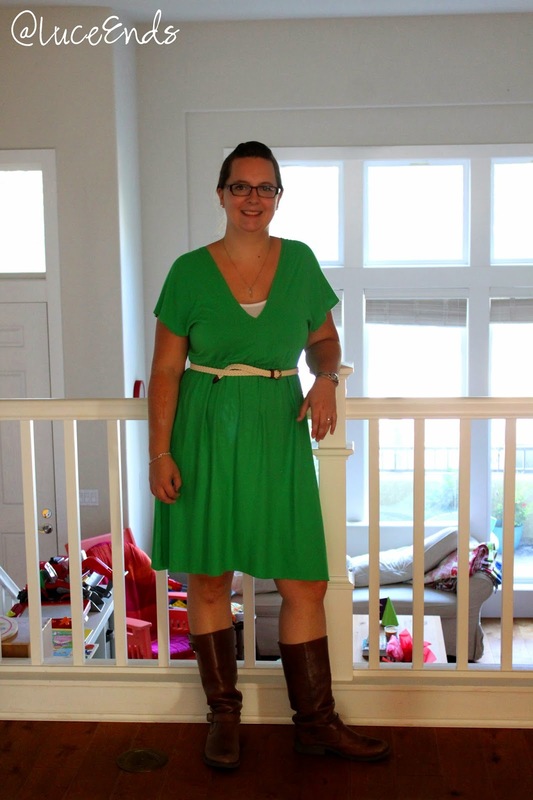 I made this dress with the Go-To Dress pattern from Tanya Whelan's Sew What You Love book. I saw the dress on a mannequin at Bolt in Portland. The gal working in the shop had made the dress and offered to let me try it on to see if I liked the fit. This gave me a little confidence that I may actually be able to sew something that wouldn't seem like a hospital gown. I bought a remnant of some knit organic bamboo blend fabric, and borrowed the book from the library. The dress is just 4 rectangles, so it is quick and easy! It probably would have been even faster if my serger was working. I used a jersey needle and a slight zig zag stitch on my sewing machine. There are several different options for length, number or gathering rows in the middle, etc. Both the front and back of the dress have the same v-neck.